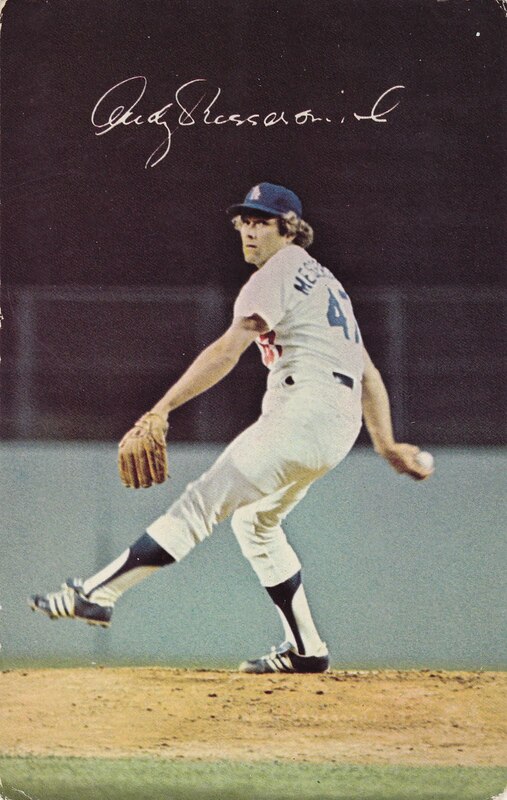 Today's postcard sits right in Night Owl's wheelhouse, as a night-time Dodger photo from the 1970s. Check out his blog's ongoing series of awesome night cards, if you haven't already. They remind you how different the game looks under man-made light. Can't tell if Andy's throwing a real pitch, but the photographer caught a nice windup pose of his curve ball or close-grip heater. Nice design choice on that white-on-black autograph, too, something you don't see much on cards from any era. The solid + green + mound card composition also reminded me of the 1933 Goudey set. All it's missing is that ad for BIG LEAGUE Chewing Gum and a 1930s patina. Today's Mitock Publishing-made postcard turned up at the 2011 National in Chicago mixed in with many others published during the 1960s and 1970s. 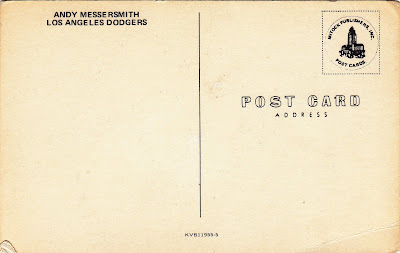 According to what I can find online, the KVB11955 tag line means 1979 and includes at least these Dodger players. Let me know if you've seen others from this series and we'll fill out the checklist. Value: I paid $4 for Mr. Messersmith, who grades a solid VG-EX. Fakes / reprints: Don't know of any in the marketplace. I suspect it'd be hard to make money faking baseball postcard, unless you went back to the pre-war era. i have a fair number of dodger postcards, but hadn't seen that messersmith. very very nice.